The far-right candidate and frontrunner in Brazil's presidential election, Jair Bolsonaro, has vowed to tackle crime and reduce record high murder rates. On the eve of Sunday's vote, he said his government would hand down the tough punishments offenders deserved. According to the latest opinion polls, about 38% of the electorate will vote for Mr Bolsonaro. Nearly 150 million Brazilians are eligible to vote in the country's most polarised election for many years. "We need to be really tough on crime to make criminals understand that they won't enjoy impunity," wrote Mr Bolsonaro on Twitter. "Things will be different now. We defend family values, the innocence of children, we treat criminals as such and we don't get involve in corruption schemes," he added. If no candidate gets more than 50% of the valid votes, there will be a second round in three weeks' time. 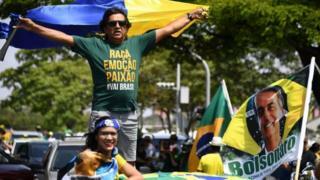 People will also cast ballots to elect all Brazil's state governors as well as two-thirds of the senators and all lawmakers in the chamber of deputies. More 1,000 seats in state legislatures across the country are also being contested. Mr Bolsonaro has missed the final part of the electoral campaign, after being stabbed at a campaign rally in September. His main rival is the left-wing candidate for the Workers' Party, Fernando Haddad. They are both expected to advance to the second round run-off on 28 October. "I don't believe in violence, in military dictatorship or the lack of liberty," tweeted Mr Haddad. Haddad, the former mayor of Sao Paulo, is backed by former President Luiz InÃ¡cio Lula da Silva. Lula left office in 2011 with high approval rates. He was jailed earlier this year, for taking bribes from a construction company. He denies the allegations and says they were fabricated to preven t him from running for office again. Lula wrote a letter of support to Mr Haddad on the eve of the vote: "Hope has previously beaten fear. Love has beaten hatred. And truth will now beat the lies. Truth is now called Haddad." Hundreds of women marched through the streets of SÃ£o Paulo on Saturday, accusing Mr Bolsonaro of being sexist, racist and a homophobe. Mr Bolsonaro has rejected the accusations. The US president's controversial nominee, Brett Kavanaugh, is sworn in after weeks of rancour. Can chocolate sweeten a bitterly divided US?